2 1/8" RWB First For Kennedy, alledgedly from the JFK campaign. Not listed in Hake. Revers shows rust spot on left of pin by blue ribbon. Rear pin type is of that period but is it truly JFK? Any other real possibilities? If you can shed some light on this item please "comment" or email us at appraisals@loriferber.com and we will post the answer. This is a large Cead Mile Failte Parade Banner that translates to "A hundred Thousand Welcomes." It was produced in 1963 on linen. It was displayed during Kennedy’s June 1963 trip to Ireland. Does anyone know the value? 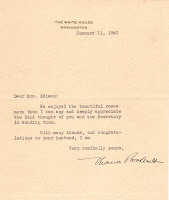 Letter on White House stationery from 1940 from First Lady Eleanor Roosevelt to the wife of the son of Thomas Edison (Charles Edison) who served as Secretary of the Navy under Franklin D. Roosevelt and Governor of New Jersey. The paper carries a Whiting's Angora watermark. Owner is interested in discovering the value and possibly selling the letter. If you have information on this letter please leave a "comment" or email us at appraisals@loriferber.com and we will post the answer.